On May 21, 1969, promoter Ed Francis presented a wrestling card at the Civic Auditorium which featured a match for the Hawaiian Championship between champion Curtis Iaukea and challenger Pedro Morales. The results of the 5 preliminary matches were: Billy Robinson over Tommy Andrews, Bobby Shane drew with Kongozan, as did Rocky Montero and Ray Kamaka. 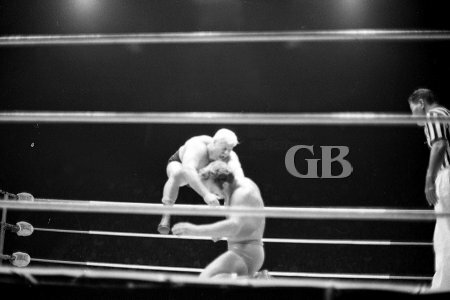 Nick Bockwinkel defeated Chris Markoff. Ray Kamaka's momentum about to slam Rocky Montero onto the canvas. 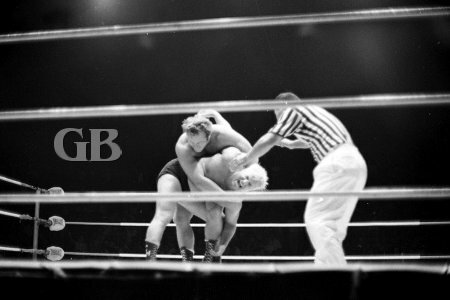 Nick Bockwinkel applies the Abdominal Stretch onto Chris Markoff. 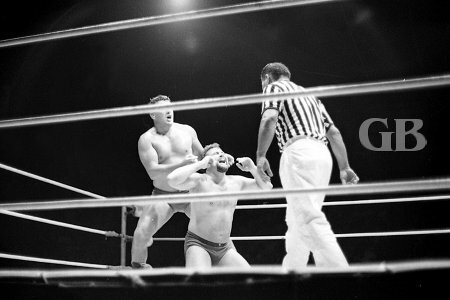 Billy Robinson releases a nerve hold on Tommy Andrews as referee Wally Tsutsumi watches. Killer Buddy Austin and Ripper Collins retained their Hawaiian tag team titles by going to a no-contest with Pepper Gomez and Dory Dixon. 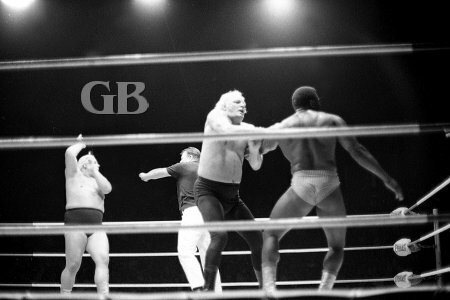 Killer Buddy Austin wrangles with Dory Dixon in the corner while Ripper distracts the referee. 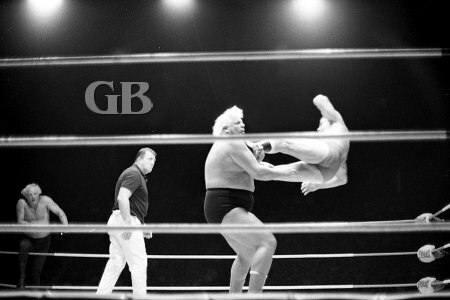 Pepper Gomez lands a Drop Kick onto Ripper Collins' chest. Likewise, Dory Dixon Drop Kicks Buddy Austin. As for the main event, Morales pinned Iaukea to win the title, but Rocky Montero who was at ring side rushed in and told the referee that morales had his foot on the ropes. The following Saturday on 50th state wrestling TV show, Iaukea showed Ed Francis a photo a fan had given him showing Morales' foot on the ropes during the count for the last fall. 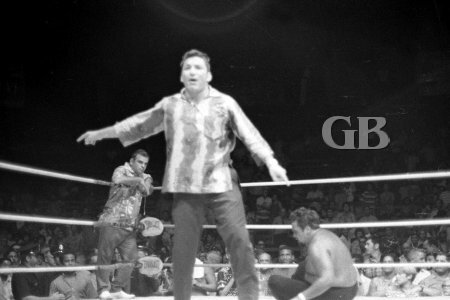 Francis took the photo from Iaukea and sent it to NWA headquarters, where Morales' claim to the title was held up. A few weeks later the NWA ruled that Morales pinned Iaukea illegally to win the title and so the championship was returned to Iaukea. 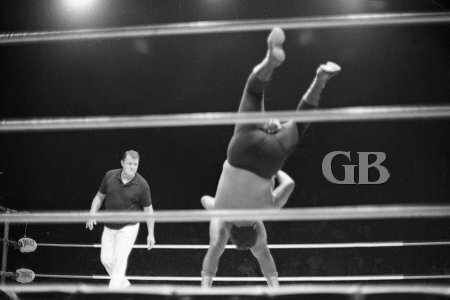 Pedro Morales Body Slams Curtis Iaukea. Morales flips Iaukea with a Back Body Drop. Curtis Iaukea seeks a time out from referee Pete Peterson. 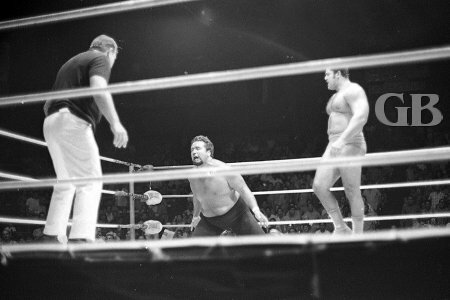 Iaukea's turn to Body Slam Pedro Morales. A bleeding and battered Iaukea watches as Pedro wins the Hawaiian Championship belt. 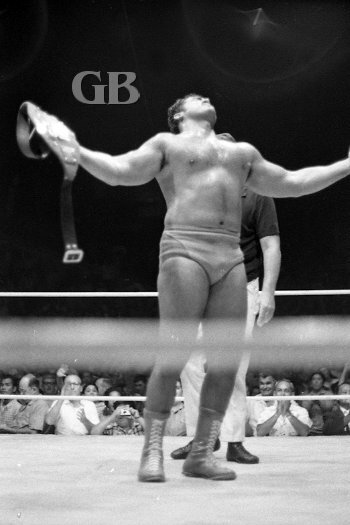 Pedro Morales, the new Hawaiian Champion. Rocky Montero barges into the ring to contest the last fall claiming Morales' foot was on the ropes during the count.